Some top prospects are already off to hot starts this season, including the SoxProspects.com's second-ranked prospect, Rafael Devers (pictured) who homered in his first Double-A plate appearance. Fifth-ranked prospect Bobby Dalbec is batting .438/.500/.625 through his first four games of the year. Aneury Tavarez, Josh Ockimey, and newly acquired Josh Tobias are also locked in so far at the plate. On the mound, Henry Owens, Jalen Beeks, Darwinzon Hernandez, and Travis Lakins are off to nice starts. Third-ranked prospect Jason Groome is scheduled to make his much-anticipated 2017 debut for the Greenville Drive tonight. Ben Taylor, a 2015 seventh-round pick out of South Alabama, has made an impact at the big-league level already this season. So far, the right-hander has thrown 1 2/3 innings of scoreless ball without allowing a hit. He has four strikeouts and two walks. Taylor is somebody that Cundall identified early as someone who could rise quickly to Fenway Park as a reliever. Brandon Workman is back on the mound for the PawSox and throwing well. He has thrown 2 2/3 innings without allowing a run, and as Brendan McGair notes in The Pawtucket Times, Workman is just happy to have made it through spring training healthy. Kevin Thomas of The Portland Press Herald writes about Beeks and how he is making himself known to the Red Sox. Beeks, a former college teammate of Andrew Benintendi, was very impressive during his first outing of the 2017 season. Travis Lakins also had an impressive start, and he spoke after the game about some of the nerves he felt. Lakins also told Andrew Battifarano of MiLB.com that he relied heavily on his fastball and slider in his first start, almost abandoning his curve and changeup completely. Alex Speier of the Boston Globe has his minor league notebook back, and in his latest addition, he notes that Dave Dombrowski does not shy away from his willingness to deal top prospects to acquire big-league talent. Lastly, we at SoxProspects.com would like to wish Matt Huegel the best of luck in his future, as he has decided to step away from writing at SoxProspects.com after seven terrific years. Scott has been an extra-base hit machine to start the 2017 campaign. The 23 year-old, who was drafted last year in the seventh round as a senior from Arkansas-Little Rock, led the nation for Division I hitters in 2016 with a .435 batting average. He also showed some pop last year in Lowell with a .787 OPS and 11 doubles, three triples, and four home runs in 49 games. He has been playing both left and right field so far this year. Lakins was dominant during his first outing of 2017. The 2015 sixth-round pick was roughed up in Salem in 2016 to the tune of a 5.93 ERA. 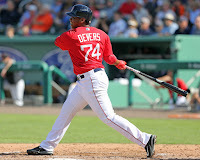 He is already off to a much better start this year and is ranked 12th here at SoxProspects.com. On the most recent podcast, Ian Cundall and Chris Hatfield discussed Lakins and his injury from last year that may have contributed to his struggles.